You’ll love this bright, flavor-packed Greek lemon rice made with onions, garlic, fresh lemon juice and herbs! 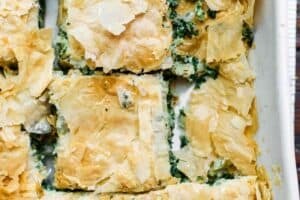 This is an easy side dish and pairs beautifully with lots of Mediterranean favorites including Souvlaki, Shrimp, and Greek baked cod and many more! Be sure to check out my tips for foolproof results, and grab all the suggestions for what other dishes to serve along! Rice cooker instructions included. 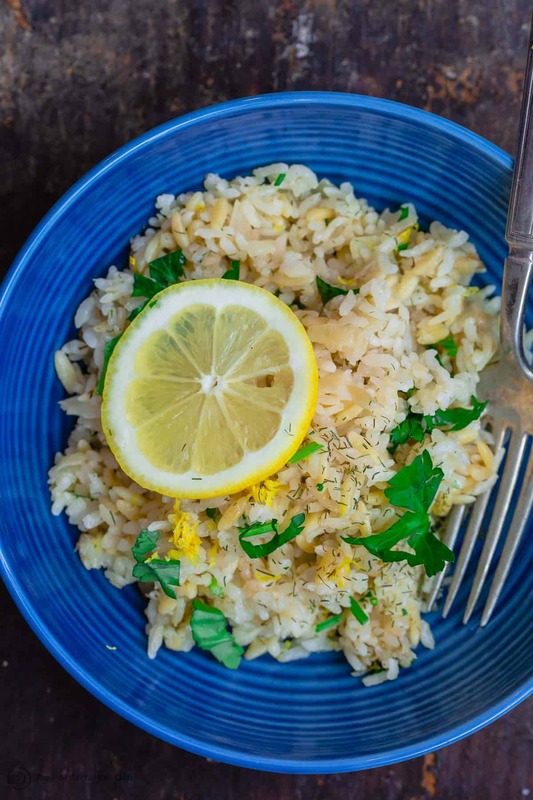 If you think rice is just a dreaded, boring side dish, this Greek lemon rice will prove you wrong. Dare I say, once you give it a try, it might just become your favorite side of all time! 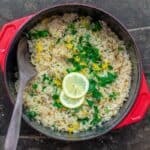 This lemon rice pilaf is a fairly popular side dish, you may have sampled a version of it at your local Greek restaurant. 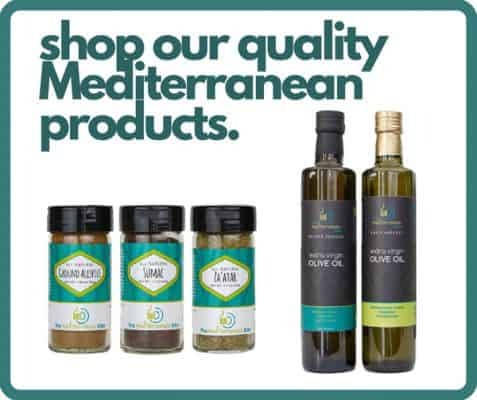 Greek Lamb (Definitely); Chicken Souvlaki; Beef Kabobs; all sorts of fish dishes like Salmon; and vegetarian dishes like Briam Roasted Vegetables. Heck, I’d turn this awesome lemon rice into a rice bowl; throw in these Keftedes or shrimp skewers and a little Greek Salad. Mmmm doesn’t that sound wonderful! 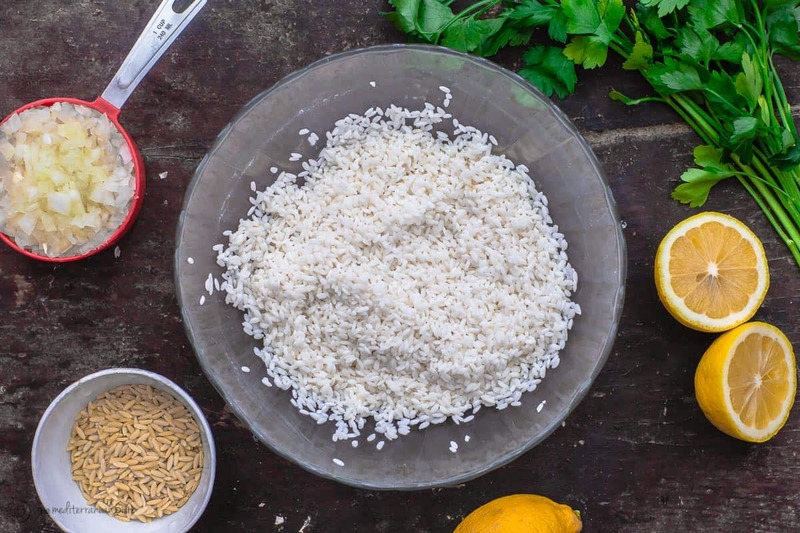 You get the point, if you’re into eating Mediterranean, this lemon rice recipe will come in handy. 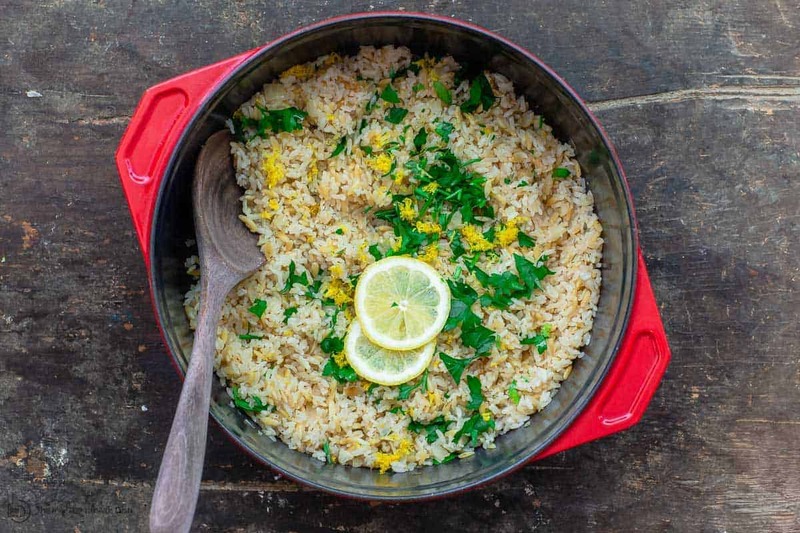 But this lemon rice is very simple to make. It starts with a little bit of rich extra virgin olive oil in which our onions, garlic are sauteed. From there, we add a little orzo, rice, and our liquid (lots of fresh lemon juice and broth). As the rice cooks in the lemon juice, it absorbs all the tang and brightness. And at the end, we hit it up with the herbs and a little lemon zest to seal the deal. 1.The recipe starts with a very important step most other recipes ignore: wash the rice well and soak it in plenty of water for 15 to 20 minutes. Do not skip this step, this is important to help get rid of excess starch which causes rice to be sticky (this rice is not meant to be sticky.) Soaking it also shortens the cooking time, making sure the interior of the grain actually cooks before the exterior looses its shape and becomes mush. 2.Once rice is finished, leave it covered and undisturbed in the pot for about 10 minutes before adding the finishing touches (the herbs etc.) Again, this helps maintain the texture and integrity of the rice. Can I make this in my Rice Cooker? Still rinse the rice very well and soak it even for a bit to get rid of starch (not a requirement for rice cookers, but helpful.) Add the orzo, rice, and liquid to the rice cooker (adjust liquid amount according to your rice cooker.) Instead of chopped onions and fresh garlic, you will use about 3/4 tsp onion powder and 1/2 tsp garlic powder (do not expect the same taste.) Set rice cooker to appropriate setting. Once rice is finished, stir in a little bit of extra virgin olive oil before adding the parsley, dill and lemon zest. 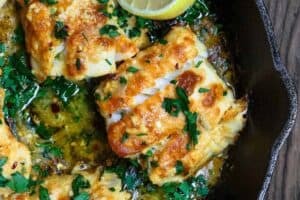 Best Greek lemon rice recipe! Loads of flavor from onions, garlic, lemon juice and fresh herbs. Be sure to check out the notes for tips and ideas for what to serve it with. Wash rice well and then soak it for about 15 to 20 minutes in plenty of cold water (enough to cover the rice by 1 inch). You should be able to easily break a grain of rice by simply placing it between your thumb and index finger. Drain well. Heat about 3 tbsp extra virgin olive oil in a large sauce pan with a lid (like this one) until oil is shimmering but not smoking. Add onions and cook for about 3 to 4 minutes until translucent. Add garlic and orzo pasta. Toss around for a bit until the orzo has gained some color then stir in the rice. Toss to coat. Remove rice from heat. For best results, leave it covered and do not disturb rice for about 10 minutes or so. Uncover and stir in parsley, dill weed and lemon zest. If you like, add a few slices of lemon on top for garnish. Enjoy! Cook’s tip #1: Do not skip washing and soaking the rice well, this is important to help get rid of excess starch which causes rice to be sticky (this rice is not meant to be sticky). Soaking the rice here also shortens the cooking time, making sure the interior of the grain actually cooks before the exterior looses its shape. Cook’s Tip # 2: Once rice is finished, leave it covered and undisturbed in the pot for about 10 minutes before adding the herbs etc. Again, this helps maintain the texture and integrity of the rice. What Dishes Go Well with this Greek Rice? Chicken Souvlaki, Beef Kabobs, Greek Baked Cod; All sorts of Salmon; Briam Roasted Vegetables. Heck, I’d throw it in a bowl with these Keftedes or shrimp skewers and a little Greek Salad. The possibilities are endless! Gluten Free & Vegan Option: All you need to do to make this rice gluten free is to eliminate the orzo. For vegan, opt for a vegetable broth that is completely vegan instead of chicken broth. Brown Rice Option: It is not my preference, but you can use brown rice in this recipe. Remember that brown rice will require more soaking time and more liquid to cook. Consult the brown rice package to adjust this recipe. Rice Cooker Instructions: This rice is best cooked stovetop, but you can try a rice cooker. Still rinse the rice very well and soak it even for a little bit to get rid of starch (not a requirement for rice cookers, but helpful.) Add the orzo, rice, and liquid to the rice cooker (adjust liquid amount according to your rice cooker.) Instead of chopped onions and fresh garlic, you will use about 3/4 tsp onion powder and 1/2 tsp garlic powder. Set rice cooker to appropriate setting. Once rice is finished, stir in a little bit of extra virgin olive oil before adding the parsley, dill and lemon zest. 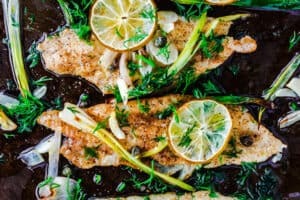 I liked the lemon and dill in this recipe, but next time I’ll cut the rice down to half. The ratio of rice to chicken broth was way off. Also, the addition of salt and pepper is definitely needed. Fresh or dry dill used? Another difference in cooking rice is your burner type. Find my induction burner always require ar least 1/4 cup extra. Usually keep warm liquid ready to add as needed. Hi Kathleen, in this recipe, we used dill weed (dry dill). And thank you for sharing your notes! BIG o on flavor and ease of prep. but 2 cups of rice to two cups of liquid is not enough. I had to add extra broth and still the rice had a little hardness to it. I soaked it for 25-30 minutes prior to cooking. I would double the liquid. Maybe 2 cups broth and 1 1/2 – 2 cups of water. Serves way more than 6. We had it with grilled shrimp and it was yummy. Hi Pam, thanks for sharing your feedback. For us, this has been the recipe we used over and over with just this amount of liquid. But I do know that the kind of rice used could make a bit of a difference. Appreciate you sharing. This dish reminds me of my childhood. So good. A perfect way to spice up regular white rice, which can definitely get boring after awhile. I love the fresh lemon flavor! Sounds like this would be a wonderful side dish to any meal. 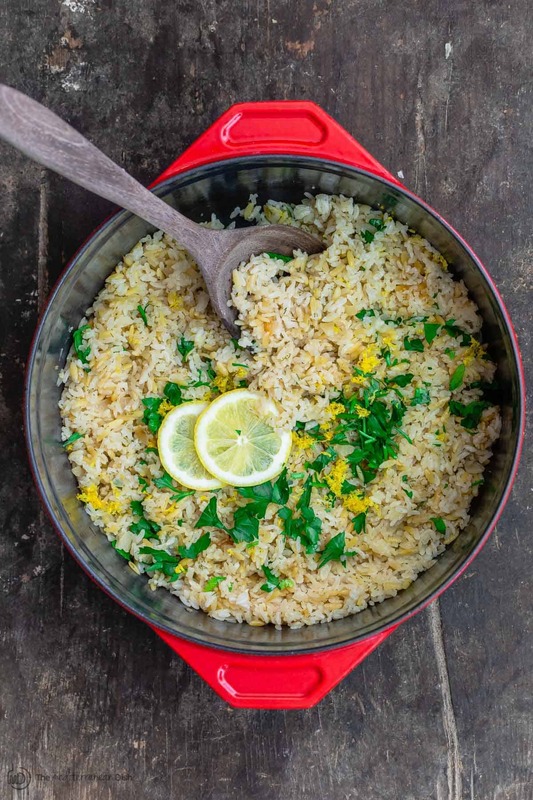 I love rice and this is so lemony and great with everything! My pleasure, Laura! Glad it worked well for you! One of my favorite meals is this rice with some baked chicken! I am obsessed with this rice. 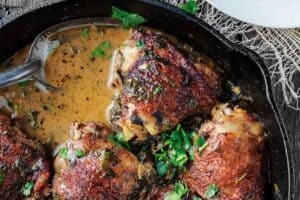 It’s so easy to make and so flavorful! So glad to hear it, Anna! Thanks for giving it a try! This rice looks so light & delicious!! I love rice with so many dishes! I’ll need to make that this week! Can’t wait for you to try it! This looks great. What do I need to do to add carrots and peas? When in the cooking do you put them in? Add the carrots and peas earlier as you saute the onions, then follow the recipe from there. Great question! Perfect recipe to go with our lamb kabobs! Simple and delicious! Looks amazing! I’ve never made rice in a slow cooker so wil have to try that out! 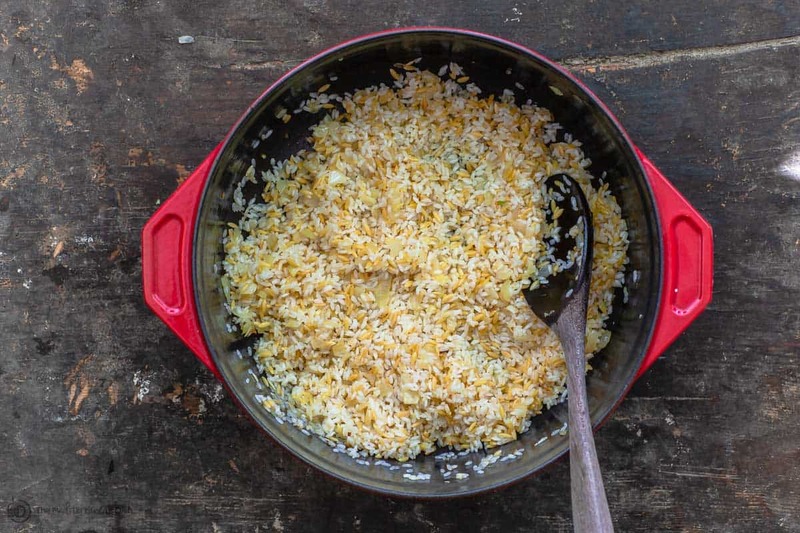 I’ve never prepared my rice like this before, but I love lemon and garlic, and Greek flavors! So good together. Thank you for a great idea! This looks delicious! I love the lemon-parsley-dill combo. Beautiful photos and I’ll have to give it a try! Not sure I’ll ever be able to eat plain, boring white rice again. 😉 This was amazing and so flavorful! I love making rice but it gets boring after a while. 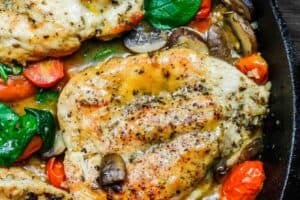 I was so exited to find this tasty recipe, love how it came out and it’s super tasty! Will definitely be making it again! I’ll have to try this. Looks much more interesting and flavorful than ordinary rice. Love the tips too!